What is it about eating food served in a bowl made out of food that makes it that much more appealing? My favorite device for doing so is acorn squash. For one thing, they are just delicious on their own, but the number of different filling combos you can use is endless. They are great as a main entree or an elevated side dish. I love to assemble everything on Sunday and then heat and eat throughout the week. This time around, I kept them vegetarian and stuffed them with sauteed leeks, mushrooms, wild rice, walnuts and sage - all topped with a sprinkling of Parmesan cheese. You can sub any veggies you like (more on that below), but I like the meaty texture of mushrooms in place of - well, meat. I find these are especially great for entertaining served alongside a simple salad; there is the obvious "wow" factor, but these are perfect for making ahead and then just popping in the oven right before your guests arrive. Imagine that: actually enjoying a drink and some appetizers with your dinner guests instead of frantically flying around the kitchen. Whatever combo you try, these are sure to be a hit. Recipe for my stuffed squash after the jump. Cut the acorn squash in half and scoop out any seeds in the middle using a spoon. 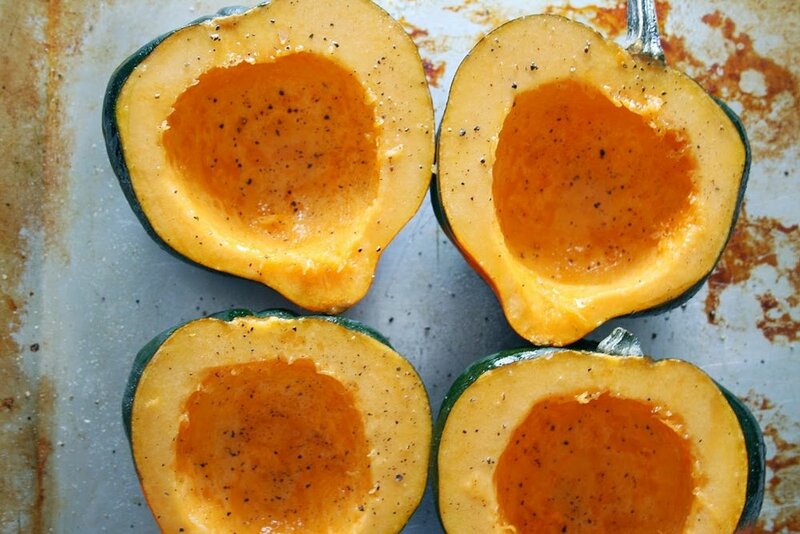 Brush the inside of the squash with olive oil and season with salt and pepper. It may help to slice a small piece off the underside of the squash (green part) so that it sits flat. Bake squash for 30 minutes or until fork tender. While the squash is cooking, melt the butter in a large sautee pan, add the chopped leeks and cook until soft and transparent (about 5 minutes). Next add the chopped mushrooms and sautee for another few minutes until the mushrooms have softened just slighty. Season with salt and pepper. Transfer the cooked leeks and mushrooms to a bowl and add the cooked wild rice, chopped walnuts and sage. Stir to combine and season to taste with salt and pepper. When the squash are done, fill each half with the all of the stuffing (it's fine if they are a little overflowing and form a nice mound). Cover the stuffed squash with foil and return to the oven for 15 minutes. Take out, remove foil and top each half with the cheese and return to the oven uncovered for 5 minutes until the cheese has melted. Serve immediately. If you are making ahead of time, do everything up until step 8 and keep covered in the refrigerator until ready to cook for serving.